Competition spurs innovation, and the world of podcast apps for iOS has shown that in effect. Castro 2 ($5 in the iTunes Store) from Supertop diverges from other podcast apps, addressing the issue of managing a flood of podcast episodes and sharing episodes among other people. The app requires a new way of thinking about podcast listening, and I wasn’t quite sure how to use it at first. That’s a one-time learning barrier, although Castro 2 could provide more handholding. While it offers tips that can be permanently dismissed, I couldn’t sort out what some basic features actually did (notably archiving) without experimentation and jumping around in the app. That aside, it’s a strong new entry, worth the price even to test it out to see if it works for you. It may become my new default podcast app, though Castro has just a few rough edges I want to see sanded down. The Queue has episodes set to play, and you can re-order them or archive them. 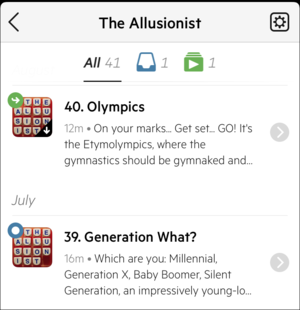 Many podcast apps organize themselves around a master list of all episodes, ordered from newest at top, and also use that as the primary playlist to determine what episode to play after a current one is finished. Some let you set up custom or smart playlists that capture different interests, priorities, or shows. Overcast 2, for example, allows prioritizing certain podcasts so that they always float to the top of a playlist. Castro downplays that in a sort of radical rethinking that has a lot of merit. 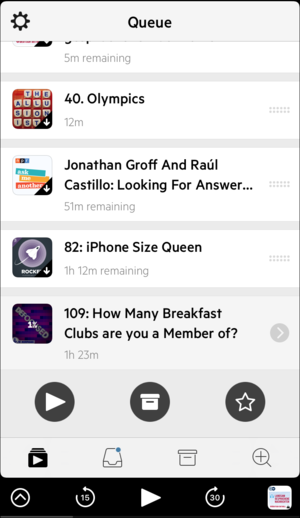 The app organizes podcasts simply into three views: Queue, Inbox, and Archive. The Queue contains all episodes to which you’ve noted you want to listen; the Inbox shows a full list of all episodes from subscriptions along with a short text snippet (the one also used for iTunes episode taglines); and Archive offers access to the favorited and played episodes along with the back catalog of all podcasts in the queue or subscribed to. This shifts the entire question of what to listen to next, as the Queue becomes a manageable master playlist. By uncoupling the full feed of all your subscriptions and any individual episodes you’ve added from the notion of a sequentially played list, Castro makes it easier to pick and choose. I subscribe to many more podcasts than I can possibly consume, and even with playlist and “keep the last X” episode options, I still find it a pain to select just the subset I want. 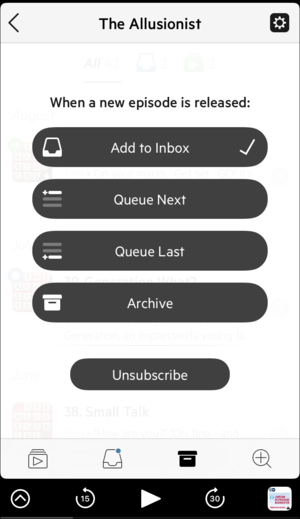 The Inbox/Queue combination feels like a more natural approach if you’re subsampling subscriptions and want to occasionally achieve Podcast Inbox Zero. While Castro adds a step to play an episode, it also reduces the stress of overabundance. The app also lets you set an upper bound by capping the number of hours of podcasts in the queue at intervals from 10 to 160 hours. You can opt to set it to Unlimited, but that’s contrary in many ways to the intention of the app. Castro doesn’t require that you manage episode storage, using the Queue and hour total to handle that. You can disable downloads altogether and stream podcasts as well. Castro offers a few ways to interact with the Queue. Tap a podcast episode anywhere in the app and, instead of that episode playing immediately, you’re presented with a set of contextual options. If it bugs you as it does me, when I miss a tap target in some podcasts apps to get show notes and the episode starts playing instead, you’ll prefer this method, too. The Inbox contains recent episodes, but it’s not a playlist; more like a set of suggestions. In every view but Queue, you see four buttons: play, which also adds the episode to the top of the queue; an add to top of Queue button; an add to bottom of Queue button; and either an Archive button or a Star button. You can also tap a right-pointing triangle for show notes. Castro doesn’t show per-episode “covert art,” which is a shame. In Queue view, you see just play, archive, and star. In the Queue, you can drag episodes around to change playback order. Playing any episode also moves it to the top of the queue. Tapping the Archive button in any view, even when you’re viewing past episodes of a podcast in the Archive view, removes that episode of the podcast from the Queue and the Inbox. Tapping the Star adds it to a Starred list, which can be found at the top of Archives. The Inbox has a nice way of swapping among podcasts. At the top, there’s a label reading All with the currently total number of podcasts. To its right, in a swipeable list, are all the podcasts that have at least an episode in the Inbox with the total of each next to an icon. Tap any icon, and you can see just those episodes. At any time, you can tap the Archive button in the upper-right corner of the Inbox, and it removes from the Queue and the Inbox all the episodes in the current view, whether All or for a particular podcast. For some frequently produced news podcasts I listen to, it’s a great way to sweep out old episodes that I’ll never tune in to. The playback view is a mix of immediately useful and less frequently needed features, and omits shownotes. I’m not a big fan of how this is laid out, because it privileges less-common features alongside very common ones. Other apps combine some version of this view with cover art and show notes, which I consult often for details and to click links, and break out more global or more tweaky settings into a submenu or place them in preferences. Instead, Castro requires you tap the scrolling podcast name and title to see show notes, and then tap the now-playing bar’s triangle to return to the play view. 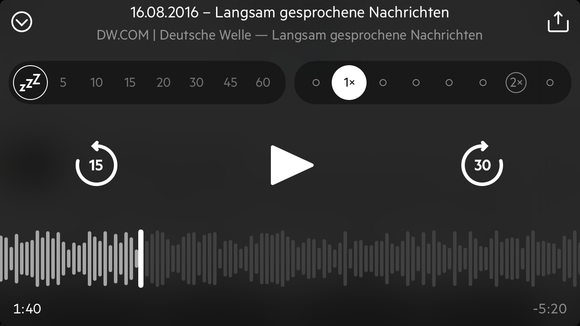 The audio scrub feature shows a representation of the audio waveform, but only a portion of the episode appears, no matter how long the episode is. You can scrub through fine and coarse intervals, and I defy you to figure this out without reading Supertop’s release notes. Drag the waveform, and you move by seconds; drag and accelerate the playhead at varying speeds to move across tens of seconds or minutes. While it’s pretty and functional, it’s too clever by half for my liking, and doesn’t match the generic, familiar audio-scrub interface that’s part of iOS. Castro lacks the extra audio features found in Overcast 2: Smart Speed, which removes short and long silences, and Voice Boost, which equalizes and optimizes audio for iOS playback. I don’t use the latter, although many people find it valuable; I do miss the former, which overcomes some of the issues with pauses that naturally occur in episodes taped live. Subscriptions are managed via the Archive view, and new episodes can be noted for the Inbox or queued. The Archive view provides an interesting complement to Inbox. It’s where episodes you’re done with in Queue and Inbox remain. At the top of the view, you can select Starred and see any episode you tagged, an easy way to find favorite episodes. The History list is also terrific: it’s every episode you’ve listened to in the order you heard them starting with the most recent. The remainder of the list lets you manage subscriptions. It shows every podcast to which you’re subscribed or for which there’s at least one episode in the queue. You can tap the podcast, and the main view shows all episodes in the feed, and has an Inbox (inbox icon) and Queue (play button icon) count as well if any episodes are in either view. 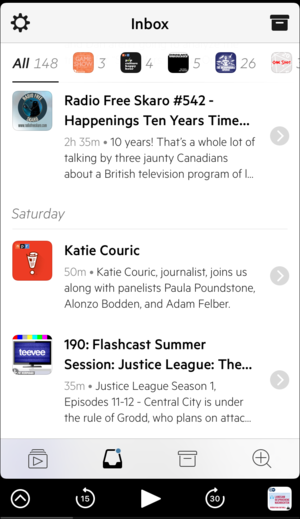 You can examine a podcast in the Archive view and see which episodes are queued or available. Tap the gear at the upper right, and you can set default options for a subscription or subscribe if you only have individual episodes loaded. Here’s where you can opt to queue (at top or bottom) any new episodes. You can also drop new episodes into the Archive, which may seem like a strange option at first glance, but makes sense if you don’t want episodes to clutter up the Inbox but have ready access to them from a list. A highly peculiar missing feature is app-wide keyword search. You can’t find episodes by title, description, or any parameter, whether in a feed or downloaded. This would dramatically improve the utility of the Archive, among other things. It should be added in a future release. Oddly, a deep search is available in the weak Discover view, the fourth main icon in the app, which is organized by categories. The search works across all feeds Supertop has retrieved via its servers, but requires an online connection. Discover lets you paste in a feed URL, but doens’t have any other options to aid in recommendations or sharing. Castro users can share individual episodes through a Share sheet available only when viewing show notes, and recipients without Castro can listen via a Web page interface. With Castro installed, opening the castro.fm URL used in sharing loads the episode into the app’s Queue. Like most third-party podcast apps, Castro can import and export a standard format list of subscriptions, and even has a specific option to import from Castro 1, Overcast, and the Apple app. The app also lets you set options for streaming and downloading over cellular, and has a night mode triggered by a two-finger swipe up or down. Castro is swimming against the tide of free apps, in-app upgrades, and free-with-patronage apps pursued by other podcast developers. Leading competitor Overcast 2 relies on voluntary contributions, which unlock a handful of modest features, and allow for recurring revenue, but all primary features are free. Castro costs $5, and there’s no way to test it before use; the app’s makers have posted videos and blog entries, and are relying in part on an existing audience and word of mouth. But $5 is a small price to pay to try out an app that sounds appealing, since you might use it for thousands of hours to come. For people who like the sense of finishability, where you’ve completed everything in a category—whether reading a stack of New Yorkers or listening to current podcasts—Castro 2 is the podcast app for you.